The weather is getting a little cooler now, perfect for those winter crops. Things are slowing down now with the coming of winter. It’s a great time to clean up debris, clean and repair tools, sort and clean seeds that you collected over the summer and other such maintenance chores. There are a few little tools/tricks that I particularly like. One is a really easy method for oiling my tools. It’s kind of a hassle to always have to get out the oil each time I finish using a tool; to make it easier, I keep a bucket of sand near where I store the tools. I poured oil – virtually any kind will work – over the sand until it’s fully moistened. Then, when I’m finished using a tool, after cleaning it but before putting it away, I just drive it into the sand. It coats the tools thoroughly, and I’m ready to put it away all oiled and protected. Another thing that I hate is tool handles that either are too slippery or ones that get damaged, making them splinter-y (is that a word?). Anyway, you know what I mean. To deal with these handles, I keep a roll of hockey tape around. The tape is really easy to use, the roll costs less than $5 and it lasts. (I’m guessing at the price because I’m not sure of today’s prices. I bought my roll in California, almost twenty years ago – see - it really does last!) The third is Velcro. Yes, Velcro - in a roll. You can buy small pieces of Velcro in garden centers for huge prices, or you can go to someplace that sells sewing supplies and get ten yards of a ¼-inch roll for about $10-12. I use it for tying up plants mostly, but I’ve also used it to repair fences and hold up trellises. It’s tough and it lasts, too. I’ve had it functioning in the weather for well over a year. The color fades, but the product is still there, little hooks holding on to little loops, holding together whatever I put it on. Anyway, give those a try and let me know what you think of them. Speaking of letting me know, any time you have a question or suggestion related to something I say here, just drop me a line. My email is maryann.armbruster@yahoo.com. Don’t forget the DOT after maryann, if you forget, the email won’t reach me. Even if you did not ask, the answer is: Yes, you can plant in December. If you hurry, you can plant radishes and garlic through the first of the month, then you can plant mustard, spinach, shallots and turnips all month long. Wait until mid-December to plant English or sugar snap peas, and onions and leeks (from sets only, it’s too late for seeds). The varieties of mustard greens that are recommended for our area are Florida Broadleaf, Greenwave, Red Giant, Southern Giant Curled, Savannah and Tendergreen. If you planted beets, carrots, radishes, turnips, rutabaga, kohlrabi or lettuces last month it’s time to fertilize (3 to 4 weeks after planting). Use 4 to 5 pounds of 8-24-24 or 6 to 7 pounds of 8-8-8 fertilizer to side dress them. Remember that your garlic, onions and shallots need to be side dressed with 3 to 4 pounds of 8-24-24 or 4 to 5 pounds of 8-8-8. Remember, these recommendations are per 100 foot row. I hope you’re enjoying the rain we’re having now – and that it doesn’t get carried away and cause flooding – I know the plants are. I hope you had a wonderful Thanksgiving, and I wish you all a safe, peaceful and blessed Christmas. See you next year. Hi Everyone. You should be in the middle of your fall harvest now, enjoying this gorgeous weather and also doing some cleanup for the winter. Now is the perfect time to clean up, getting rid of those dead plants, taking care of tools, etc. Remember to either bag and throw away or burn any plant material that is diseased or heavily infested by insects or full of seeds, but compost most stuff rather than throw it away. Every piece that you can recycle within your property adds to your level of sustainability. Creating your own compost, rather than purchasing it in bags is a great If you’re not composting now, you really should start. You know that compost adds organic matter to the soil, as well as providing a bit of nutrition, but the thing that it does the most is feed and support the micro herd. Those little guys work so hard supplying nutrients to our plants and keeping the soil open to allow air and water to move through easily, that we should really do everything that we can to help them out. That includes providing them with compost, avoiding tilling as much as possible, avoiding chemicals, which kill them, and keeping the soil covered with organic mulch to prevent dramatic temperature swings, maintain even soil moisture, and provide a continuous flow of organic material for the micro herd. There are a lot of ways to make compost. There’s the traditional way of building a holder or multiple holders for the waste to be composted, loading up the first one, periodically turning the material from one container to the next one until the material is well broken down, and then putting it on the garden. There’s a lot of material on composting, from books and magazines, to tons on the internet, so I’m not going to do a treatise on composting, but I will mention a couple of easy ways to make compost that don’t involve turning or building or much else that involves hard work. Here’s one method that works especially well if you don’t have very large quantities of waste. Just keep a blender reserved for kitchen wastes on the counter or any other easily accessible area. It has to be easy to reach or you won’t do it. As each bit of waste occurs, add it to the blender and replace the cover. When the blender gets about half full, add some water and blend it up. Really grind it up good. You want tiny, tiny pieces. Now take it to the garden, pull back the mulch over an area, pour on the contents of the blender and replace the mulch. Done! The tiny bits - thanks to the blender - will break down very quickly, providing nutrients and humus for the micro herd and through them, for the plants. But what can you do when you have larger quantities to deal with — either because you cook for a lot of people or you’re including lots of garden waste and leaves, too? Well, just designate a shady area that is both out of the way and readily accessible to the garden. Pile all of your stuff there. The pile should be at least three feet square, but more is fine. Once everything is piled up, water it well, cover it with a tarp, and forget it for a year – with one exception. During dry weather you can check it periodically and add water if it gets too dry. It should be about as damp as a wrung out sponge. But you only have to do that if you want to maximize the output. When you take that tarp off at the end of the year, you will have a beautiful pile of compost. All you have to do is move it to the garden. Thus the reason for choosing a spot with easy access to the garden. There may be a few large pieces that aren’t fully broken down yet, but all you have to do is sift or pull them out and throw them on the start of next year’s pile. Matador and Prisma for bulbs and Evergreen for greens. You have more choices with spinach – Bloomsdale Long-Standing, Melody (AAS, DM), Unipak 151 (DM) and Tyee (DM) are all recommended savoyed or wrinkled varieties. By the way, ’DM’ after the name stands for downy mildew resistance, and since that is one of the worst problems we have with spinach, I think it pays to choose downy mildew resistant seed. If you prefer the smooth-leaf types, choose Ballet or Tiger Cat, neither of which is resistant to downy mildew. When selecting turnip seed, the recommended varieties are Just Right (AAS), Purple Top, Shogoin, Tokyo Cross (AAS), and White Lady. Well that’s about it for November. I hope you continue to enjoy this beautiful weather. If only it would rain a little. Remember when we were complaining about too much? It’s HOT! At least it is now, while I’m writing this. I sincerely hope that by the time you’re reading it the heat wave will have broken, it will be considerably cooler and we will have had some nice, long, slow rains to cool us off and give the poor plants the water they so desperately need. But I still have to write this now, so here goes. While it’s hot you know it’s important to keep your plants watered, but how often and how much? How do we accomplish this in view of the water restrictions so many of us are facing now? What to do instead? Water long, slow and DEEP. This encourages new roots to develop deep in the soil so when the shallow surface layer dries out, the plant is in good shape, with its roots deep in moist soil. Applying about an inch, or in this heat maybe an inch and a half or even two inches, once a week will keep your garden healthy. Water VERY early in the morning, before 6 if you have an automatic system, or as early as you can get out there if you have to do it manually. Watering at ground level prevents a lot of water loss to evaporation, and puts the water at root level where the plants can use it. It also avoids wetting the foliage which can lead to disease under the right conditions, so if you have soaker hoses, use them. If not, you can do what I do and lay a hose on the ground with the water turned on low to medium – not a strong force, you don’t want to create a gully – then just let it run for about 30 minutes. I set a timer and keep going out to move the hose. Over the course of the day I can quite thoroughly get a great deal of the garden watered. There is just one caveat though, everything I said above applies to plants in the ground. Plants in pots are totally different. Plants in pots have nowhere for roots to go looking for water. In pots there is no ‘deep’. Pots have to be watered when they get dry - period. Test by sticking your finger into the soil; if it feels dry, water. In hot weather pots may need to be watered daily, sometimes twice if it’s hot and windy. The only way to tell is to test. After a while you will become good at determining how often to water. Another way is to feel the weight of the pot after it has been thoroughly watered. It feels heavy. Then, as the water evaporates, the pot gets lighter and lighter. With a little practice it becomes easy to lift the pot and determine that it needs water. It keeps your finger clean, too. Since I wrote the above I looked at the forecast and saw that we are supposed to have a 60% chance of rain today and over each of the next five days. Maybe, maybe not. 60% chance it will rain where you are, 40% it will not. I hope we all get some good rain, but the information about watering is good to know anyway. When I got home from the Board meeting it had rained a little here. HOORAH!!! Can you plant now? Yes, but… It will take extra work to plant when it is this hot and dry. Especially with delicate seed, like carrots, it will require extra vigilance on your part to make certain that the seeds and seedlings are never allowed to dry out. Until the middle of September you can continue to plant bush snap beans, English peas, Irish potatoes and pumpkin. Any time during September you can plant beets, broccoli, Brussels sprouts, cabbage, Chinese cabbage, carrots, cauliflower (transplants), Kohlrabi, lettuce, mustard, radish, shallots and turnips. September is your last chance to plant collards until next March. Starting in midSeptember you can plant onions and leeks. Onions are interesting plants. First, they are biennials, so it takes two seasons to go from seed to seed and those seasons are divided by winter cold. Onions are also photothermoperiodic – isn’t that a great word? It means that onions are affected by both day length and temperature. Starting from seed, the onion germinates at soil temperatures of 55° to 75°. The plant grows, then when the daylight hours reach a given length (which is variety specific) the plant stops growing leaves and starts forming a bulb (this is the ‘photo…periodic’ part of the word). Then when the plant is exposed to temperatures of 40° to 50° (again, variety specific) it stops making bulb and begins forming the flower (called ‘bolting’). This is the ‘…thermoperiodic’ part of the word. So varieties perform differently depending on day length. There are actually three groups of onions, short day, long day and day neutral. Short day onions will begin to form bulbs when the day length reaches 10 – 13 hours. These are good for us. In the north, the days get long early in the spring when it’s still cold causing the plant to form tiny bulbs. Growers in the north need to plant long day onions, ones that don’t start making bulbs until the days reach more than 14 hours. It’s warmer then and they can get a good crop. Here, our days never reach 14 hours, so planting long day onions will result in a really disappointing crop. No bulbs at all. Unfortunately, most onions are long day type, so you have to make certain that you’re getting short day or at least day neutral varieties. The Ag Center recommends the following reds: Red Creole, an open-pollinated heirloom that can be used to save seed, and Southern Belle, a short-day hybrid. Never save seed from hybrids. They do not breed true. For whites: Candy and Savannah Sweet, and for yellows: Granex 33, Grano 520 and Texas Grano 1015Y. You might also find local offerings labeled ‘Texas Sweets’. These are Granex under another name. Onions have small root systems so it’s very important to make sure they get regular nitrogen before bulbing starts. This means supplying them with nitrogen regularly. If you’re using chemical fertilizers, the Ag Center recommends fertilizing onions and shallots with 4-5 pounds of 8-8-8 or 3-4 pounds of 8-24-24 per 100 foot row four to six weeks after transplanting. Other varieties recommended are beets: Detroit Dark Red, Kestral, Red Ace and Ruby Queen. A beet that I like a great deal is Cylindra, a Danish heirloom. Each root is normal beet width, but instead of being round they are long like a carrot, giving a lot of uniform slices from each root. Various seed companies describe it as 5 to 8 inches long. Of course that depends on when you harvest it. I’ve grown it every year since I discovered it, both here and in Arizona, and I’ve gotten excellent yields in both locations. It tastes great, too; in fact its other name is Butter Slicer, it’s that smooth. The greens are not just edible, but delicious both raw and cooked. For carrots the Ag Center recommends Danvers 126, Purple Haze (this one has purple skin and orange flesh), Deep Sails, and for deep soil, Apache, Enterprise, Maverick and Navajo. I also like one called Purple Dragon; this one has purple flesh with an orange core and there is another that I just discovered called Dragon – it’s solid purple. I haven’t tried it yet, but I will be doing so soon. I’ll let you know how it handles in the garden as soon as I know myself. Burpee offers a mix called Kaleidoscope. It contains white, yellow, orange, red and purple varieties. I actually bought that mix a couple of weeks ago at a local produce store. It looks beautiful in the bowl and on the plate and tastes just as good as it looks, so I have high hopes for the seed. Well, it’s certainly HOT. Remember when we couldn’t wait for it to warm up a little? And, of course, since it’s so hot, it’s also dry. It’s not that we have too little rain here in south Louisiana, it’s just that it’s distributed so poorly. First we get too much, then not enough. Oh, well, if we had just enough, just when we needed it, that would be heaven, and we’re not there yet. But there are some things we can do in the garden now, early in the morning and late in the evening, to be sure. Don’t go out from 10 a.m to 2 p.m. for sure. Please, when you do go out, make sure to use sunscreen, wear a hat, and stay hydrated. You don’t want to suffer from heat stroke or heat exhaustion. By now you should have harvested a lot of tomatoes. If you planted any of the heat set varieties, they should be doing well now. They are called ‘heat set’ because they are resistant to the changes induced by high temperatures that cause normal tomatoes to stop setting fruit when the temperature rises. You might even save some of your regular tomatoes if you prune them back, give them a fresh coat of organic mulch and feed them well. Compost tea works very well here, as does fish emulsion. Both work great as foliar feedings. Then by the time the temperatures come down moving into fall, those great root systems should push out new growth and a fresh crop of tomatoes. You can save money on new transplants and get a great fall crop to boot. You can do the same to peppers if they stop producing. Eggplant should continue straight through as they love the heat. You might want to give them a boost with a foliar feed of compost tea or fish emulsion while they’re bearing heavily. Also you can begin planting fall crops now. If you’re quick you can plant cantaloupe, okra, summer squash, southern peas, and watermelon from seed, and bell pepper and tomato transplants through early August. Then starting in mid-August you can plant bush and pole snap beans, beets, broccoli, Brussels sprouts, cabbage, Swiss chard, kohlrabi, Irish potatoes and lettuce. You might want to protect the lettuce from the afternoon sun. Throughout the month of August you can plant Lima beans, cauliflower, Chinese cabbage, collards, cucumbers, mustard, pumpkins, rutabagas, shallots, and turnips. The Ag Center tests different varieties throughout the state and chooses the best performers to recommend, so you can trust that these varieties will give you a good chance of a plentiful harvest. Some of these suggestions are for broccoli: Arcadia, Diplomat, Gypsy, Packman, Premium Crop, Windsor, Green Magic, and Everest. I have planted both Packman and Premium Crop and had long plentiful harvests. One stand of Packman kept producing for 18 months. Every time the plant started to flower I cut them off and new side shoots developed. For cauliflower they recommend: Candid Charm, Cumberland, Freedom, Snow Crown, Incline, Majestic, and Wentworth. I’ve grown Snow Crown with excellent results. Recommendations for bush Lima beans include: Dixie Butterpea, Fordhook 242, Henderson Bush, Jackson Wonder and Thorngreen. The only one that I have seen locally is Henderson Bush. I’m sure you could find any of the others if you search online sites such as Southern Exposure Seed Exchange http://www.southernexposure.com, which specializes in seed for the South, or Seed Savers Exchange www.seedsavers.org, a cooperative/commercial venture. Membership to the latter gets you a catalog larger than many phone books where people offer seeds that they have grown and collected. There is often an interesting tale attached to these seeds. Of course there are many strictly commercial ventures out there in web land where you can purchase heirloom seeds, like Johnny’s Select Seed or Baker Creek Heirloom Seed, or you might be interested in Southern Seed Legacy http://anthropology.unt.edu/anthatunt-ssl.php, an effort of the anthropology program of the University of North Texas, which encourages seed saving and seed exchange among its members. Membership starts at just $15 a year and entitles you to a directory and two free seed packets through their annual seed exchange. A quick search online will open the doors of seed exchanging for you. It’s a great way to maintain biodiversity and food security. Well, most of the spring planting has been finished and we’re starting to harvest a lot of produce. Some of the very early, cool-weather crops are finished and being pulled up. This leaves us with open ground and the problem of what to do with it. That got me thinking about what goes with what, so I decided to write about companion plants today. So what comes to mind when you hear the words, “Companion Plants”? If you’re like most people, including me, you think of plant x improving the harvest or reducing the pest load of plant z. But how does that happen? Companion plants assist in the growth of others by providing nitrogen, and other nutrients, attracting beneficial insects, repelling pests, providing shade and/or support, or by maintaining moisture in the soil. Many plants we call weeds may also function as companion plants. Some examples of these are Russian thistle, chickweed, and dandelion. How do you learn what plant actually helps what other plant? Let’s go to the internet and see what we can find. What I found were lists -- lots of lists: lists that are inconsistent, lists that disagree totally. Let’s try to get to the bottom of these lists and figure out what really helps what. While exploring the idea of companion plants I learned that our ancestors had some strange ideas when it came to plants. Some of the plant combinations in these lists actually come from medieval writings when plants were believed to be governed by planets. After all, there is only one letter different between ‘plant’ and ‘planet.’ [Smile] Later lists were made by writers who believed in the “Doctrine of Signatures” These people believed that God made plants in a way that signified their uses. A heart shaped leaf, of course, meant that the plant was good for the heart. Yellow wood or juice meant that the plant could be used to treat jaundice. Get it? Was it right? Well, we don’t believe it any more, do we? Yet some of these beliefs linger on in these lists. I think that the most common way that a plant gets on a list as a ‘good’ companion plant goes like this. Joe the Writer usually plants his tomatoes near the carrots. This year, for some unknown reason, he plants the tomatoes next to the zucchini – lo and behold – he gets a bumper crop of tomatoes. Why? Who knows? But our gardening friend, Bob the Writer, comes to the conclusion that it’s the result of planting them near the zucchini, and another companion plant is born. Can we decide that one plant makes a good companion for another plant based on one growing season in one locale? No. Emphatically, NO! To be valid, a study of this sort should be large, multi-season, uniform in measurements, the tester(s) should be known, and the results – positive or negative - should be published or otherwise distributed. Are there any studies like this? Yes, there are. Not nearly enough, in my opinion, but there are some. Unfortunately, there are a whole lot more done by Bob the Writer and his pals. Let’s look at a classic example of companion plants, the Three Sisters of the Indian tribes of the American Southwest – corn, beans, and squash. The farmer would start by planting the corn, then when the corn plants were about 6 inches high, would plant the beans around the corn plants. Later when the beans were up, he would plant the squash seeds among the other two. Not only did the corn provide a trellis for the beans to climb, but the beans helped to stabilize the corn stalks against wind damage. Corn has short, shallow roots and is easily knocked over by strong winds. As we know, the beans fixed nitrogen, thus providing an important nutrient for itself and the other two plants, and the squash acted as living mulch, preventing water from evaporating. In addition, the living mulch kept the soil cooler, the spines on the squash kept certain pests away, and the large leaves and tall stalks added organic matter when turned in at the end of the season to improve the soil for the next crop. The companionship continued into the plants’ interactions when providing nutrition for the humans who planted and ate the crops. The corn and beans combined to provide a complete array of amino acids, thus creating complete protein. The squash and beans provided carbohydrates completing the nutrient profile of the meal. Some plants have intrinsic systems that repel pests. These systems can be used to our advantage by planting the pest-repelling plant near other, pest-sensitive plants. A commonly cited example of this is marigold. A good scientific study was performed testing the ability of marigold and calendula to reduce the population of aphids and flea beetles when intercropped (companion planted) with cabbage. The study was titled, “Effect of intercropping white cabbage with French Marigold (Tagetes patula nana L.) and Pot Marigold (Calendula officinalis L.) on the colonization of plants by pest insects”. It was published in Folia Horticulturae, Ann. 21/1, 2009,95-103. The study was large, took place over three years, the test plants were randomly chosen, and the pests were carefully counted including eggs, larvae, pupae and adults. The results showed that calendula was actually better at reducing the infestation of aphids then marigold was, but marigold was better at reducing the infestation of flea beetles. Both did adequately reduce the numbers of insect pests. Let’s start by thinking about what makes a good companion plant. First, the two plants should not be in direct competition for all the same environmental conditions or nutrients. For example, do you think that two plants, one with a short, spreading habit and the other with an upright habit, both of which like full sun and are heavy feeders for nitrogen would make good companions? Probably not. One would shade the other and they would compete for the available nitrogen. So we can start with simple things like sun/shade, heavy feeder/light feeder, or heavy nitrogen feeder/nitrogen fixer, spreading root system/deep taproot to start making decisions about what to plant near what. If you want a ‘companion’ that reduces pests, choose one with a strong smell, like marigold or garlic. Good old tomatoes are a great companion crop for asparagus because they produce solanine, a glycoalkaloid poison. This compound is harmless to humans, but deadly to the asparagus beetle. Sometimes the benefit is mutual as with bush beans and potatoes. The potato protects the beans from the Mexican bean beetle, while the bean protects the potato from the extremely destructive Colorado potato beetle. Flea beetles are attracted to eggplants, radishes, tomatoes and turnips and chew small holes in the leaves. Interplanting with lettuce or mint will control the pest. Marigolds exude thiopene into the soil which reduces the population of soil nematodes, making marigolds a great companion for tomatoes which are known to be bothered by nematodes. Salvias are also said to reduce the nematode population. Perhaps it would be beneficial to plant a stand of asparagus edged with tomatoes and marigolds. The beautiful nasturtium is an effective trap crop for red spider mites, aphids, and white fly. Often a pair of plants may provide help for each other, like carrots that are bothered by carrot flies and leeks that are bothered by leek moths and onion flies. By interplanting carrots and leeks both plants are protected. Apparently, each plants gives off distinctive odors that attract its particular pest(s), but the pests either cannot tolerate the scent of the other plant, or the combination of odors confuses the pest, preventing it from finding its preferred crop. When carrot or leeks are planted alone (monocropped), the insect pest detects a smorgasbord and invites all its friends. To summarize, companion planting works in a variety of ways. Some of these are: As trap crops, where one plant is chosen to attract pests from a nearby crop. For example, collards will attract the diamond back moth away from cabbage. By biochemical suppression of pests, in which chemicals are exuded from the roots and stems of one plant and kill or suppress a pest of another plant. By nitrogen fixation, where legumes take nitrogen from the atmosphere and ‘fix’ it in the soil in a form that can be taken up by themselves and other plants. By physical spatial interaction, in which a tall sun-lover grows happily next to a low-growing plant that prefers some shade. By establishing a habitat to attract beneficial insects for the benefit of a second plant. By nurse cropping, where taller plants with thick foliage protect other plants by shading or shielding them while they are young. This is similar to physical spatial interaction, but is used to protect certain crops, like oats sown with alfalfa so that the alfalfa can become established in the protective shade of the oats, and lastly, By ensuring diversity, a more general approach that can confuse insect pests and helps to insure that at least some of the crops will produce a yield. Rain, RAIN, RAIN!!! The only thing I can say is we need the rain and at least a lot of it has been slow and gentle. That’s just the kind of rain that can soak into the ground and do some good instead of creating runoff and causing problems with erosion. Nonetheless, I’m ready for it to stop. Once the rain finally stops you’ll be able to get back into the garden and plant. After all this rain, however, be sure to check the soil before working it. If you work soil that is too wet you’ll destroy the soil’s structure, forcing all of the air out. This leaves the roots unable to do their job adequately and your plants may not do as well as you had hoped. Soil structure, you say? What is soil structure? Well, soil structure refers to the pattern of solid particles and air spaces found in healthy soil. The soil’s structure controls the movement of air and water into and through the soil. The spaces between aggregates contain air and hold water and soluble plant nutrients, making them available to plant roots. There are many different soil structure patterns depending on how much clay is in the soil, how much organic matter there is in the soil and a few other factors. Now, unless you’re a soil scientist, all you really have to know is that soil structure is important, and you don’t want to destroy it. Any time you till or cultivate the soil, however, you destroy the structure to some degree. Regular tilling, especially machine tilling with heavy machinery, changes the structure over time and this causes major changes in the microherd. (The microherd refers to all the bacteria, actinomycetes. fungi, protozoans, worms and other critters that live in the soil. There are between 100 million and one billion organisms in just one teaspoon of healthy soil.) Working the soil when it’s too wet is the absolute WORST thing that you can do, especially when the soil is basically clay, like we have. The way to avoid working the soil when it’s too wet is to test it before starting to dig. Do this by taking up a handful of loose soil. Close your hand over the soil and squeeze lightly. Open your hand again. If the soil falls apart it’s either too dry or nearly pure sand. This almost never happens here. If it holds its shape, poke it lightly with a finger. If it falls apart when you poke it, it’s perfect to work, but if it doesn’t fall apart, it’s too wet. Absolutely DO NOT work the soil until it dries some! If you do, you will destroy the soil structure, and your plants will suffer. The microherd that are trapped in that area will die from lack of oxygen and the microherd from the surrounding areas will have to work overtime infiltrating that area and restoring the structure. It could take many months. Aside from not devastating the soil by working it when it’s wet, there are things that you can do to improve soil structure. The first, and one of the easiest is to add organic matter to the soil on a regular basis. The reason that you can’t add it once and be done is that we live in a mostly hot, humid climate. The organic matter that you add this season will be used up and reduced to humus within a short time leaving the soil in need of another shot of organic matter. So make it a habit to continually add organic matter to your soil. You can do this by regularly adding compost, worm castings or other organic materials, and by covering the soil with organic mulch and renewing it annually. Now, when it’s dry enough for you to work the soil, what can you plant now? If you hurry you can get very early bearing tomato plants in and you might get fruit before the heat gets to be too much for the plants. Alternatively, you could plant some of the “heat set” plants during the first week in May and get fruit through the heat. These plants are designed to tolerate heat because their pollen does not deform when the temperature climbs. You could also hurry and plant hot peppers from seed and Swiss chard. Remember that Swiss chard is beautiful and can be planted among your flower beds with no problem. Before mid-May you can plant bush or pole snap beans, sweet corn, and sweet pepper transplants. Any time during May you can plant Lima beans, cantaloupes, cucumbers, eggplant from seed or transplant, okra, peanuts, Southern peas, hot pepper transplants, sweet potatoes, pumpkins, summer squash, and watermelon. Spring is FINALLY here. You know that it’s said that March comes in like a lion and goes out like a lamb, and that was really true this year. I think that our freezes are over although there are a couple of nights predicted to be down in the 40’s — but the high 40’s at least. We can all be planting pretty much any of the heat loving plants that we want right now – whether from seed or transplant, except for tomatoes. It’s too late to plant them from seed now because they won’t be able to produce much, if anything, before the intense heat sets in, slowing down or stopping production. Better to wait until June, then plant seeds for the fall harvest. Of course we can continue to plant all of the beans and Southern peas, but English peas and all of the pod-peas should be producing well now, but will begin to decline as the temperature rises. Now is a great time to start melons of all types. They will mature in the heat of summer and produce the sweet, juicy fruit that makes summer tolerable. You can still plant Swiss chard, which is a wonderful green. I like the new, tender leaves in salads – they make a nice replacement for lettuce when it gets too hot for its liking – and all of the leaves can be cooked like any green. I must say that I really like it lightly steamed with garlic and onion and seasoned with a little ham or bacon. It’s delicious either way, raw or cooked. If you’ve never tried it before, plant some. It only takes a two or three plants to provide for the two of us. You certainly don’t need a row full. And chard is such a beautiful plant that you can plant it in the front yard as an accent plant as I do. Some varieties, like Bionda de Lyon or Forkhook, have white midribs, others, like Rhubarb chard, have brilliant ruby colored midribs, or the neon pink of Flamingo chard. Then there are the varieties, like Bright Lights, that provide a delightful mixture of white, yellow, orange, pink and red. Of course you can continue planting collards all month long, as well as eggplant and all types of peppers, from seeds or transplants. Okra can be planted now without fear of losing it to the cold. If you are in the mood, you can plant peanuts now, although that is one plant I’ve never tried to grow. You can plant squashes all month long and sweet potatoes after the 10th. If you want to try an unusual, but delicious squash – it’s really one of my favorites – try the scalloped squashes. The Ag Center recommends Patty Green, Peter Pan, and Sunburst as varieties that do well here. The spring vegetables are winding down now. All of my cauliflower has been harvested and there is quite a bit in the freezer. I am still harvesting the broccoli side shoots and will probably continue to do so until the summer heat makes them too bitter. Then, maybe I’ll pull them up, but not as long as they keep producing well. Now is a good time to treat the soil with worm castings over any bare spots or side dress any plants that that are showing buds or fruiting. It won’t burn anything, but it can be a little pricey, so use it sparingly. Twenty percent seems to be the optimal quantity to get great growth without spending too much. Of course, if you ‘grow your own’ it doesn’t cost too much. I have a storage container that serves as my worm bed. Drill holes for air and give them good things to eat, that is, a great deal of the kitchen waste. Don’t feed the worms fats, or dairy, citrus, or any other acid food, like tomatoes, or meat, or anything that’s really rotten, and they don’t seem to like seeds. They thrive on most other things, anything green from lettuce to asparagus to zucchini. Add some slightly moistened, shredded paper, and shortly, you will have worm castings. You can look up worm bins on the internet and you will find a wide variety of designs, but I find the simple 5 gallon bucket or Rubbermaid-type storage container to be the simplest for me. Well, I’m going to cut this a little short tonight. This cast makes typing quite uncomfortable – not to mention full of errors that have to be fixed. Well, it’s cold again, but, this is a great time to start seeds. We have discussed the benefits of starting your own plants from seed, so I won't repeat them here. Believe it or not, now is the time to start tomatoes, peppers and eggplant from seed. 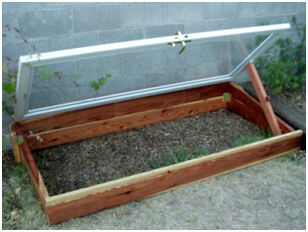 If you don't have a greenhouse and, like me, don't have a lot of good window light, you might want to try a cold frame. 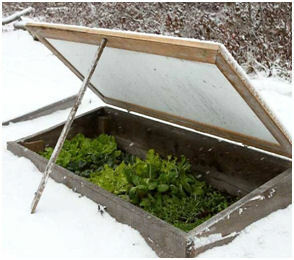 A cold frame is like a mini-greenhouse, specifically intended for seed starting. You can build one easily. A simple frame, with an angle to the top allowing the cover to slope top to bottom, and an old window as the top works fine. 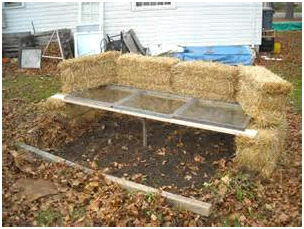 The sides can be wood, cement blocks, or even hay bales as shown in the photos below. You can place the cold frame anywhere as long as you can access it easily - because you have to open it during those warm days that we have here from time to time. Leaving the cold frame closed on these days can cook your tiny seedlings, and we don't want to do that. 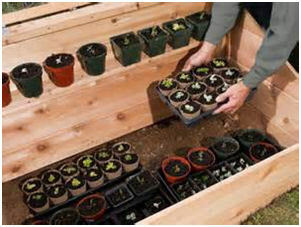 Place the cold frame in a handy place so that you can open it in the morning when necessary. It can be placed in a garden bed, on the lawn or even on a drive or other hard surface. The frame should be oriented so that the shortest depth faces south. This allows the most sun to the plants inside. Now you have some choices to make. You can plant the seeds in the garden soil if the frame is set over a garden bed, but if you set the frame over lawn or hard surface, you can either fill the frame with good soil, or you can plant in pots or 6-packs and place those into the frame. Keep the seeds evenly moist and watch for temperature extremes. If low temperatures are predicted, cover the entire frame until it warms up again. If high temperatures are predicted (over 50) open the lid and prop it open, a little or a lot depending on how high it is supposed to get. Now that you have a place to plant those seeds, which seeds do you plant this month? As I mentioned earlier, it’s time to plant tomatoes, peppers and eggplants. You can also plant kohlrabi, but plant these inside, or in the cold frame, not out in the open yet. There are seeds you can plant outside in the open garden now though. All month you can plant beets, Swiss chard, Irish potatoes and radishes in the open garden. Through the middle of the month you can plant broccoli, Chinese cabbage, carrots and cauliflower, then starting mid-February you can plant beans and sweet corn. I know the list is not as long as usual, but this is the middle of the winter, after all. There are few insects around this month, but the weeds are already starting. Try to keep those under control while they are tiny and while the ground is soft from the rains. It’s so much easier that way, and yes, I know just how easy it is to not pull them, because they are so small and innocuous. But they grow so quickly! If you don’t pull them NOW, they will be out of control and setting seed before you know it. After you clear away a section of weeds you can sprinkle that area with corn gluten meal, an organic pre-emergence herbicide. Corn gluten meal stops seeds from germinating for about six weeks, then breaks down into a nitrogen fertilizer to feed the transplants that you will put in later. It’s available in a couple of name brand products, like Preen, but that’s the expensive way. If you go in online you can find it as the generic ‘corn gluten meal’ for a lot less. I found it at the big box stores in liquid, ready to spray formulations and the more normal granular formula. Use five pounds for 250 square feet or follow label directions.